Brand New to the rental market. This is a beautiful updated Ariola Drive house with unrestricted gulf views and beach access just steps from the driveway. This vacation home has a gorgeous living, dining and kitchen area decorated in traditional coastal colors. The blues and greens of the gulf run throughout the entire space. The kitchen is a dream, with custom cabinets, counters, and appliances. You won’t find another place to cook a meal that’s as beautiful as this! The kitchen opens to a spacious dining area with seating for 8 at the table and another 3 at the bar. You can also enjoy the large outdoor dining table on the adjacent deck. The gulf side living room has a lovely fireplace, comfortable seating, and a large flat screen TV. There is a second living space on the main floor with a sleeper sofa and tv for those in the group who might want a little quiet time to themselves. This area also has a complete bath. This floor has the master suite with full bath which opens onto the expansive gulf side deck. This bedroom has a beautiful antique king bed and adjoining private bath. The second floor has 5 bedrooms and 3 full baths. Each bedroom is as unique and inviting as the next. The first bedroom is the 'master' bunk room with ensuite bathroom and gulf views. It has two queen and two twins so it sleeps 6. The second bedroom on this floor has a king bed, gulf views, and shares the hallway full bathroom. The third bedroom is another bunk room with a queen platform bed and two twin built in bunks in an outstanding custom design. The fourth and fifth bedrooms share another bath and are sure to please. One is furnished with a king bed and the other with two queens. This property is immaculate and planned for large groups to vacation in comfort and beauty. You will not be disappointed in location or decor. 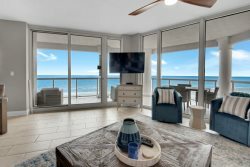 Book now to enjoy gulf views and great beach access. We had the great pleasure of working with a wonderful person. Unfortunately I am terrible with names, but I believe her name was Beth. She was absolutely amazing to work with and resolved a couple of minor concerns quickly, all with a beautiful smile and attitude. We have rented from Gulf Coast Getaways for several years now. Minor issues were handled immediately. We have always be happy rented from them. They are the first place we check when looking for vacation rentals. It was an awesome place to spend time with friends and family. Everyone felt the same way about the property. Thank you Beth (I hope that is her name) and thank you Gulf Coast Getaways..! The staff was friendly and helpful. They responded with in a reasonable time period whenever we needed assistance. My family and I really enjoyed our stay. This was the first time I booked a vacation home and I was a little hesitant about the entire situation. But after being able to speak with the owners about the reservation, I felt at ease. When we arrived at the home, it was everything the website said it would be and more. We had 10 people in our group and there was more than enough space for everyone. The pool was beautiful. The rooms and the views from the rooms were beautiful. I am very happy with my decision with booking this vacation home and would do so again. Thank you so much. Comfortable home, lots of room, easy beach access, great pool. It met our needs and made the family vacation a success. The management was always willing to answer questions and help when needed. We loved the house and how close to the beach it was. Perfect for families with children!